AN ARUP-CARDNO JOINT VENTURE UTILISED 12D SOFTWARE FOR ITS WORK ON DETAILED DESIGN FOR PORTION C OF THE WOOLGOOLGA TO BALLINA PACIFIC HIGHWAY UPGRADE. THE SOFTWARE PROVED AN ASSET AND TIME SAVER FOR THE DESIGN TEAM. The Woolgoolga to Ballina project (W2B) is an immense undertaking that involves a 155-kilometre upgrade of New South Wales’ Pacific Highway to dual carriageway, along with major grade separated interchanges and upgrades of existing roads. The Australian and NSW governments are jointly funding the $4.36 billion Woolgoolga to Ballina Pacific Highway upgrade. Roads and Maritime Services Pacific Highway Project Office and Pacific Complete (joint venture between Laing O’Rourke and WSP) are working together to deliver the project. Due to the sheer scope of the project, Pacific Complete separated the extensive design process and construction work into a number of portions. The brief called digital engineering processes to be incorporated during detailed design as part of Roads and Maritime Services initiative to use building information modelling (BIM) technologies. This was to provide the capability to create and manage the delivery of the project effectively and streamline future maintenance of the asset. An Arup-Cardno Joint Venture (ACJV) won the detailed design contract for the section between Devils Pulpit and Richmond River, Broadwater in November 2015. This work package involved a 35-kilometre realignment and upgrade including grade-separated interchanges to provide access to the Woodburn and Broadwater townships from the highway. Niall Brady, Senior Engineer – Transport & Resources at Arup, worked on the project and explains that its design challenges required a unique solution from the get-go. 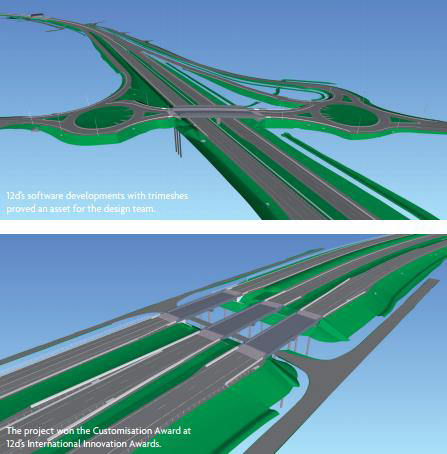 Thedesign of the highway included accurate 3D models of all pavement layers, earthworks, kerbs, line marking and safety barriers, divided into 100-metre intervals to facilitate integration with Pacific Complete systems (quantification, 4D etc.) The naming – or tagging – of all elements within the model and drawings also had to align with the Pacific Complete Integration naming protocols. Likewise, the drainage elements required a 3D model for all pipes, headwall, culverts, basins and drainage channels, all of which required their own tag. “The brief was quite complex in that every element had to be named using these protocols – every signpost, barrier – every aspect had to have its own individual tag,” says Mr Brady. He explains that one of the benefits of such comprehensive tagging included allowing the asset owner to individually identify elements that would require maintenance, such as safety barriers, during operation. Pacific Complete’s naming protocol for design elements contained more than 100 components that needed to be tagged and subdivided into location, direction, family and number. The ACJV would eventually have nearly 100 staff working on the project at its height, so the sheer scale of the undertaking was always a challenge, but Mr Brady says the design team had to approach the project unlike any other highway project because of the complexities of the modelling, tagging design elements and dividing the alignment into 100-metre sections. “Before we started the project, we had to see how we could deliver on these stringent requirements,” says Mr Brady. Pacific Complete did not mandate the software to use, so in order to address this challenge, the ACJV team needed to find the right software to provide a comprehensive solution. Mr Brady was responsible for completing a review of the available software for implementing the digital engineering aspects on the project. The aim was to identify the most efficient process to complete the project’s BIM requirements, while also catering for cross collaboration between different disciplines. Given its latest developments with 3D mesh surfaces (known as trimeshes), use of snippets (coding tools) to standardise naming, and workflow tools – or chains – to help streamline processes, 12d Solutions’ design software was selected for the civil aspects of the project. 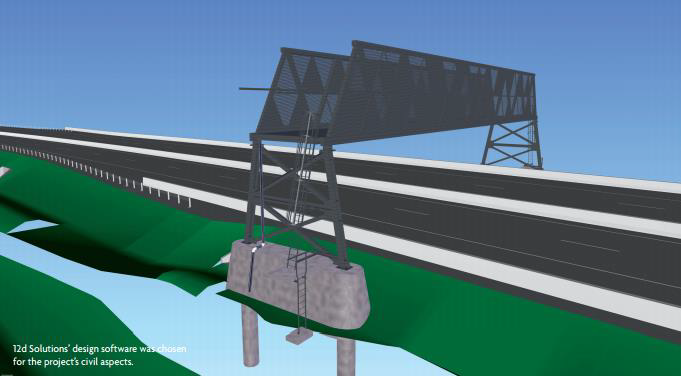 The design team was responsible for developing the customised snippets and chains to create the BIM models for the highway and drainage elements, as well as applying unique attributes to each element and the correct naming conventions. To ensure the project met its design briefs, predominantly adhering to the BIM naming protocols set out in the brief, Mr Brady developed a 12d Project Plan. “The alignment was divided into individual 12d projects with strict naming convention for models and strings to ensure clean collaboration between sections and disciplines and consistent naming for BIM tagging,” he explains. Mr Brady says the software’s user-friendly design meant it saved hours of time, cost and effort for the overall design team. “We had up to 15 12d users working on the project who all came with different experience and it was easy for them to pick up the software and run with it,” he says. He says the BIM models were exported from the 12d model consisting of 3D mesh surfaces saved with Industry Foundation Classes (IFC) files. This industry standard format allowed the BIM models to be imported into Autodesk Navisworks along with the structural bridge and culvert models, to check for said clashes between design elements and existing utilities. Mr Brady says this approach allowed the design models of all portions, from different design software, to be collaborated and reviewed in one 3D space. To undertake the process of labelling and scheduling all kerbs, barriers, line marking and water quality basins, the team developed chains using 12d Model software to automatically tag these elements in the design plans. The schedules were then outputted to Excel with little manual input from the team. He says the ability to create macros within 12d allowed the team to then import the tags from the Excel schedule to AutoCAD to display the tags on all the drawings. Not only did this process ensure consistency but it helped to remove human error in AutoCAD labelling the elements. Mr Brady surmises that the ability to control the naming and to set up standard snippets using 12d software meant it was a real asset to the project. As a result of its successful use of 12d Model software on the W2B project, the ACJV was awarded the 2016 Customisation Award at the 2016 12d International Innovation Awards.